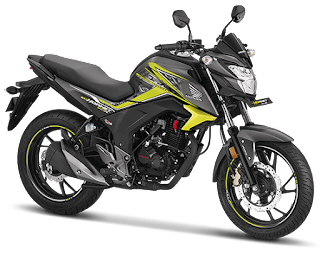 Honda has just launched 2018 Honda CB Hornet 160R ABS with an Ex-showroom price of Rs 84,675.This bike is available in 4 variants - Standard, CBS, ABS and ABS Deluxe.The new model has new body graphics and updated instrument cluster.2018 Honda CB Hornet 160R has single-channel ABS system.This is considered to be the budget bike.The main rival of Honda CB Hornet 160R is TVS Apache RTR 160, Bajaj Pulsar NS160 and Yamaha FZ-S.Honda is the only company in India which provides LED headlamp in this price segment.we provide a complete infographic about specs and features. 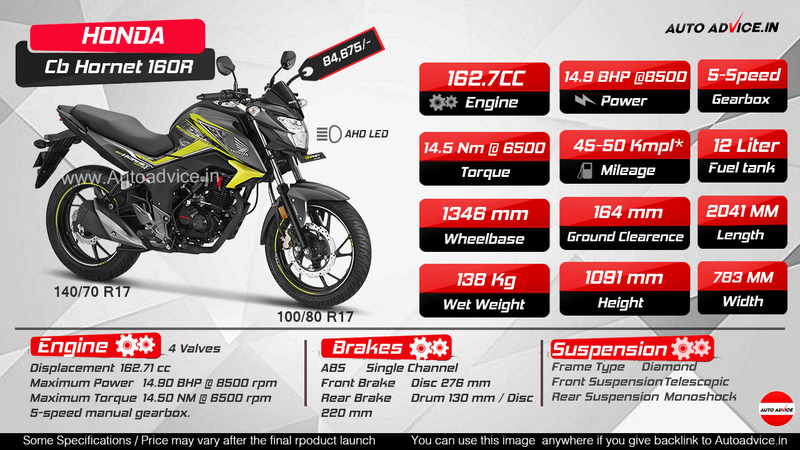 It has 162.71cc, single-cylinder, air-cooled engine which gives a maximum power of 14.9bhp at 8,500rpm and a peak torque of 14.5Nm at 6,500rpm.CB hornet has 5-speed gearbox.Honda CB hornet 160R is updated with body graphics and few electronic changes. - updated instrument console, and new graphics. -The 2018 model year also gets a new paint scheme.